This Saturday we’ll have our final garden work day for 2018. Not so much fresh fruit to sample this time of year (citrus almost ready in the greenhouse, some ground cherries and persimmons outside), but lots to do and some seed and plants to share. And some of our perennial vegetables like Korean celery are coming back into tender, delicious growth. Projects will include: kiwi trellis construction, compost management, greenhouse winterization, and lots of planting in the greenhouse to start fun new perennial crops for spring. It’s peak tree fruit season. Pawpaws, American persimmons, Asian pears, boiled yamberries… our chestnuts will kick in any day as well. Come help out with seasonal tasks and sample some fall fruits and vegetables. Sign up here to let us know you’re coming. Getting to be a good time of year to send people home with seeds again, we have Korean celery, yamberry and more. Hi everyone, we’ll be having another work day from 9am-12pm this Saturday, September 8th, 2018. It will include weeding, harvesting, and pruning. We’ll also start seeds for winter greenhouse vegetables. Sign up here. We’ll be tasting peaches, Asian pears, the last clove currants, and other seasonal delights. A longer-term project we’ve started is to update the map and species list for our garden. Here’s the first installment: trees and shrubs over 12′ tall. Hello everyone, we’ll be back out in the garden from 9am to 12pm this Saturday, August 18. Out activities will mostly be weeding and harvesting. We’ll have the chance to sample some seasonal fruits (lots of peaches) and vegetables (sweet potato greens, yard-long beans, and some others). 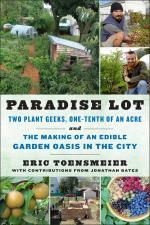 If you’d like to see what an permaculture edible landscape looks like after a dozen years, this is a good place to do that. Sign up here. Last weekend thanks to our fantastic work day team we were able to muck out our rather neglected water garden. Now it is stocked with mosquito-eating goldfish and loaded with fantastic aquatic vegetables. This year we’re growing arrowhead, Chinese lotus, water celery, water fern, a native edible water lily, an edible aquatic native hibiscus, and our native skirret (water parsnip). Here’s a photo of the garden in its glory a few years ago – we’ll do even better this year!